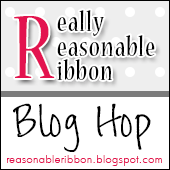 Welcome to the Really Reasonable Ribbon April Blog Hop. 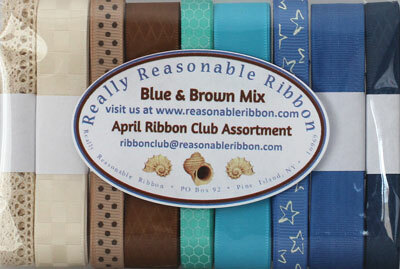 This month the Really Reasonable Ribbon Monthly Ribbon Club Assortment is a pretty beach themed mix of blues and browns. The April Ribbon Club Assortment contains 9 styles and a total of 17 yards of ribbon and crochet lace. Each monthly assortment is a color or holiday themed ribbon collection. What a fun way to build your ribbon stash and try new ribbon styles. This month I create a pretty floral all-occasion card using some pretty dies from Cheery Lynn Design along with some of the ribbons from the April Ribbon Club Assortment. I love the bold look of this color combination. 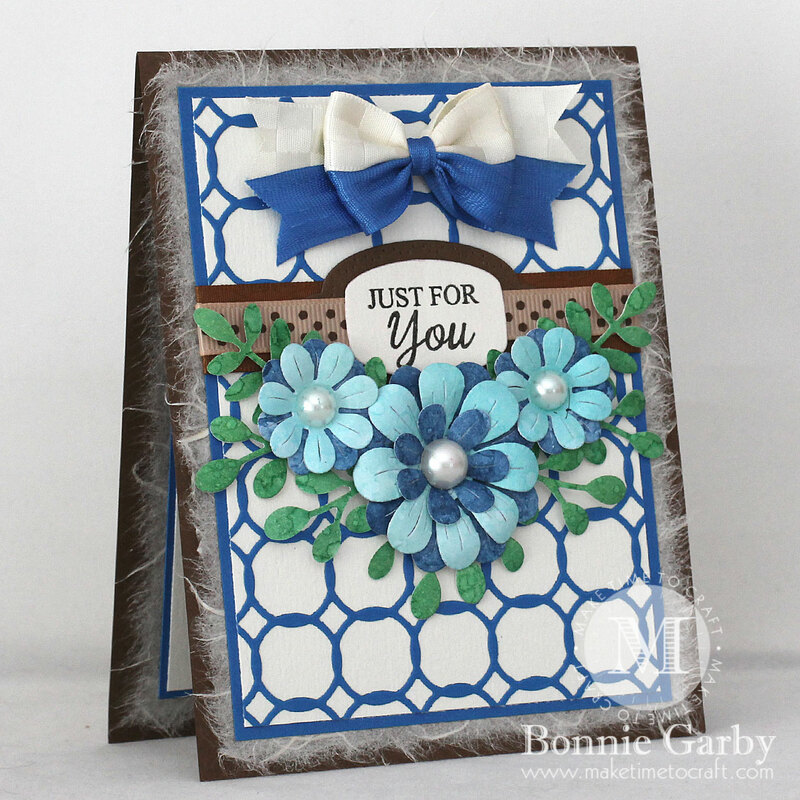 I created by background by cutting the lattice die out of blue cardstock and layering it on a cream cardstock background. I then ran a piece of brown ribbon across the center of the card, added the base of the sentiment frame, layered the tan swiss dots ribbon on that and then added the sentiment panel.Next I pulled out my very favorite flower die set – the Floral Bouquet Kit, and cut the flower and foliage pieces. I shaped them using a foam pad and stylus, assembled and added white half pearls for the centers. I then arranged the floral cluster below the sentiment. My card is topped off with a pretty bi-color bow created on my Bow-it-All V3.0 Tool using two of the ribbons from the April Ribbon Club Assortment from Really Reasonable Ribbon. I also ran two ribbons from the assortment across the center of the card behind the sentiment. 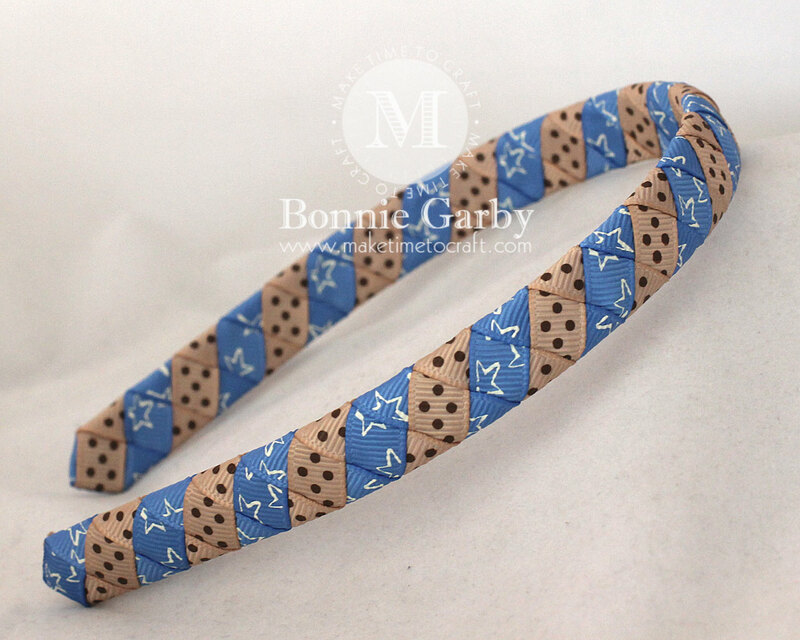 This headband was created on a 1/2″ White Plastic Headband using the two of the 3/8″ printed grosgrain ribbons from the April Ribbon Club Assortment. Very nice card! And, LOL, even though I have no interest or use for one, I always enjoy seeing what you do with headbands! You are incredibly inventive and creative when it comes to making these…I’ve taken some ideas from you in the past and incorporated them into paper working! A botanical beauty, Bonnie! Love your hand made flowers and the soft, natural color palette! Beautiful card. I love your background die and that double bow. Very creative!! Thank you for the inspiration! Love the soft, fuzzy layer on which the card sits. Very clever idea! That bow really caught me by surprise! Thanks for the tutorial on making one for myself! Well done! What a beautiful card with gorgeous colors and a wonderful sketch. Love how you used the mulberry paper! 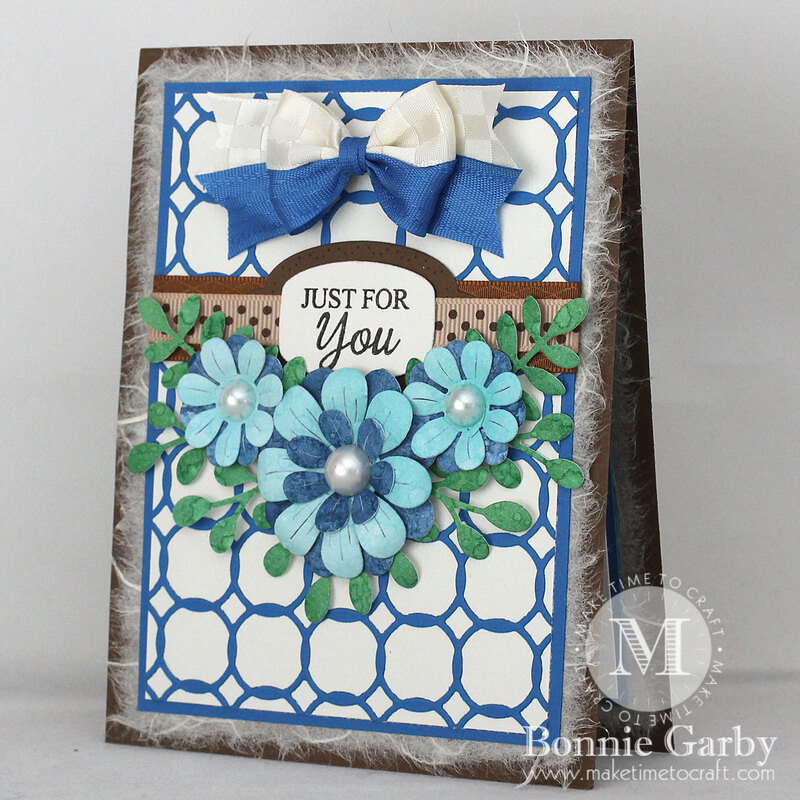 Thanks so much for playing along this month at my Crafty Wednesday challenge -say it with flowers! Bonnie, love your tri-fecta blossom beauty!! Beautiful double bow and color combo! Beautiful card and headband! Love this color combo! Wow the colors are wonderful and the Browns just draw your eye to the sentiment. Wow! A wonderfully bow and such a beautiful card composition! What a stunning card!! I love the colors and the beautiful flowers!! The double bow looks amazing!! I love the headband, too!! Thanks so much for playing along at Scrapy Land!! Beautiful!! 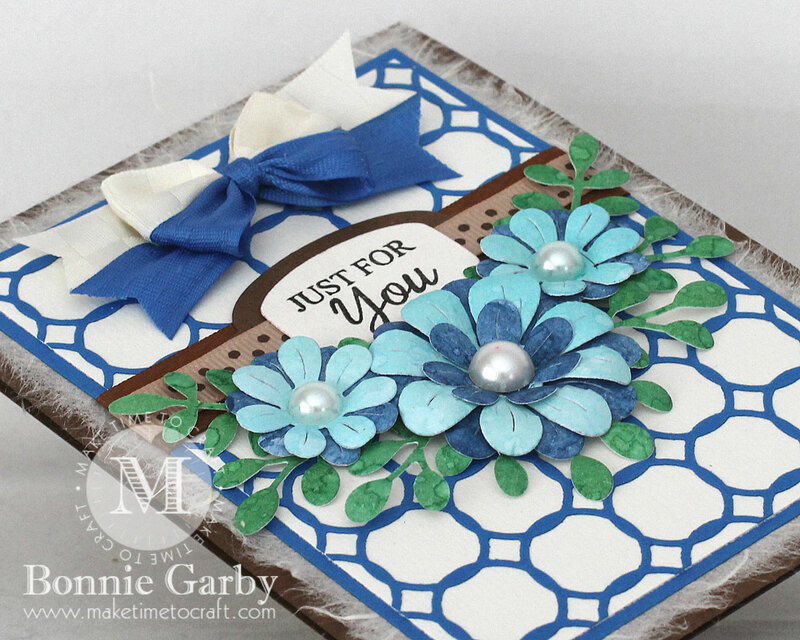 Love those flowers and that lattice die! Thanks for playing with Jo’s Scrap Shack. Gorgeous project. Love both of them. Thanks for sharing with us at Creative Moments.